In 1961, the philosopher Bertrand Russell said President John F. Kennedy and Prime Minister Harold Macmillan, because of their commitment to nuclear weapons, were worse than Adolf Hitler.. 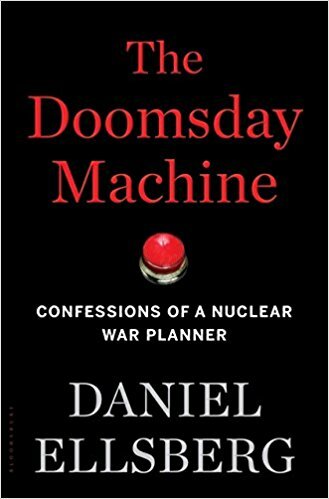 I recently got around to reading Daniel Ellsberg’s 2017 book, THE DOOMSDAY MACHINE: Confessions of a Nuclear War Planner, which indicates that Russell was basically wright. Kennedy, like Truman and Eisenhower before him and every President since, was willing to threaten nuclear war. Ellsberg wrote that this not only could have led to the death of virtually the whole human race, but, on Kennedy’s watch, very nearly did. I remember the 1950s and the 1960s, and the public’s well-founded fear of nuclear war back then. The fear has gone away, but the danger hasn’t, as Ellsberg made clear.. The book is in two parts. The first is a personal history of nuclear policy, leading up to the Cuban missile crisis. The other is a historical look at how American leaders in World War Two came to regard mass killing of civilian populations as morally acceptable, and how no American leader since then has been willing to give it up. The Eisenhower administration had a war plan called “massive retaliation.” That meant that in the case of military conflict with either the USSR or China, the U.S. would implement a plan that called for the nuclear bombing of every town in Russia with a population of more than 25,000, and also every large population center in China. The Air Force, in response to a query by President Kennedy, estimated that this would result in the deaths of 324 million people in China or Russia through blast and radioactive fallout, which is more than died at the hands of Hitler, Stalin and Mao combined. It estimated that up to an additional 100 million people in Communist ruled nations in eastern Europe, in allied nations in western Europe and also in neutral nations, depending in which way the wind was blowing. This amounted to more than 600 million people, a quarter of the human race at that time. But wait. There’s more. The Air Force did not attempt to estimate casualties due to fire. Nuclear bombing would have set off fire storms that would have made World War Two Hamburg, Dresden and Tokyo seem like the victims of children playing with matches. Ellsberg wrote that, if you count direct deaths to fire, a nuclear attack on the Communist bloc would have taken the lives of between one third and one half of humanity. I can’t get my mind around such an enormity. All of these estimates were based on a successful U.S. first strike that destroyed the Communist countries so completely that their military would not be able to retaliate. If that didn’t work, there would have been tens of millions or hundreds of millions of American deaths as well. Later on certain scientists awoke to the possibility of “nuclear winter”. Firestorms resulting from a nuclear attack would send so much soot and smoke into the upper atmosphere that they would literally blacken the sky. The dark layer would be above the clouds, so there would be no rain to wash it down. It would remain for 10 years or more, making it impossible for plants to grow or for most complex life-forms to survive. So an all-out nuclear attack could literally be a Doomsday Machine. Daniel Ellsberg is famous for leaking The Pentagon Papers, a secret history of U.S. policy in Vietnam. 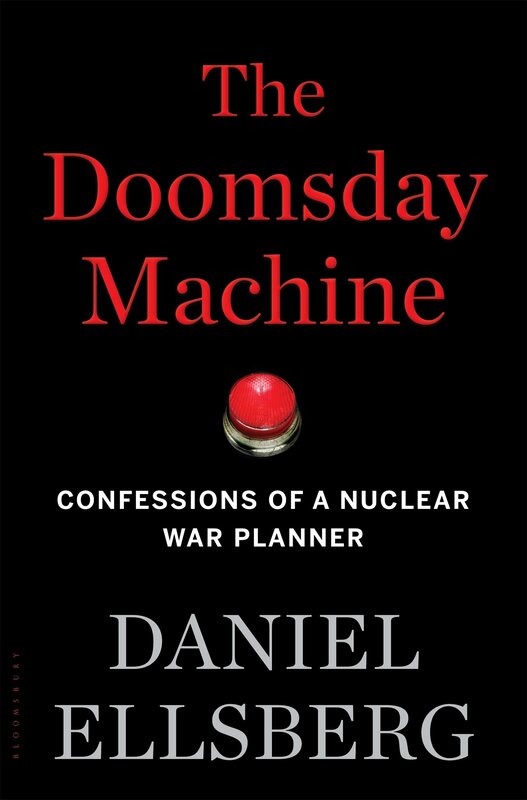 Now he has written a new book, The Doomsday Machine, which reveals the history of how close the United States came to all-out nuclear war. The war policy of President Eisenhower was “massive retaliation.” That meant the only U.S. response to Soviet or Chinese aggression would be all-out nuclear war. Secretary of State John Foster Dulles went to the brink of war at least three times, Life magazine reported at the time. There was even an argument during the Kennedy-Nixon debates as to whether nuclear war would be justified if the Chinese government took over the tiny coastal islands of Quemoy and Matsu. That was known at the time. What wasn’t known was that the authority to order a nuclear strike was delegated to military commanders in the field. We the people thought the decision rested solely with the President. That wasn’t so. U.S. plans called for the complete destruction of every city in Russia and China. Pentagon planners told Ellsberg that this would result in 325 million casualties in Russia and China, plus an additional 100 million in Communist-ruled countries in eastern Europe, 100 million in neutral countries and 100 million among western European allies. As Ellsberg said, this is the equivalent of 100 Holocausts. It doesn’t include the number who would die as a result of Soviet retaliation. Evidently it was thought necessary to credibly threaten to destroy Europe in order to defend it. Defense Secretary Robert McNamara’s ideas about escalation during the Kennedy administration can be seen as an attempt to create an alternative to immediate massive retaliation. But while, in a way, well-intended, McNamara’s ideas were illogical. Once launching a nuclear war is an option, the logic of game theory says you should be the first and not the second to escalate to nuclear warfare. Ellsberg said every Cold War President through Jimmy Carter and Ronald Reagan gave military theater commanders the authority to use nuclear weapons. He doesn’t know the situation now. One difference is that U.S. presidents now threaten nuclear attacks against countries without nuclear weapons—a crime against humanity in and of itself, even if you don’t consider the deaths of neutrals and allies. The U.S. government should join with the Russian government to resume the process of gradual elimination of nuclear weapons that was begun in the Reagan-Gorbachev years. In the meantime, Congress should enact a law to forbid a U.S. nuclear first strike without a formal declaration of war.